As I mentioned in my New Year goals post, I'm working to improve my German skills in 2017. 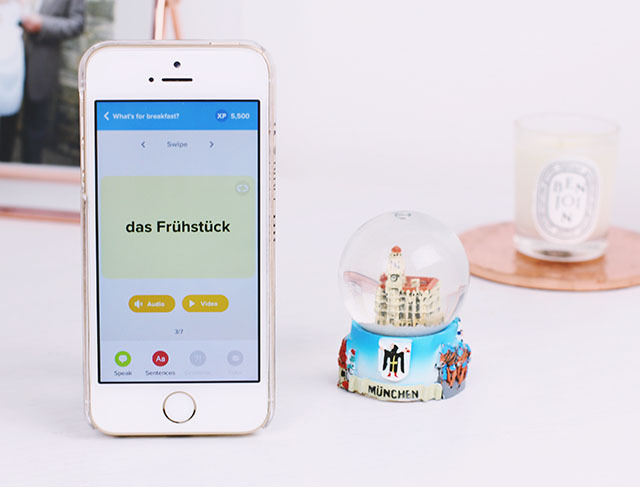 I've been learning informally for a few months now and towards the end of 2016, Flashsticks contacted me to ask if I would like to try out their language-learning app. Since I was already teaching myself German, it was perfect timing. There are a huge range of language courses available, from French and Spanish to Latin and British Sign Language, so there's something for everybody. I like the idea of learning with an app since I don't really have the time or bravery to go to traditional classes. This way I can pull up the app whenever I have some spare time and pick up where I left off. Of course a downside of this is that you miss out on interaction with a fluent speaker but Flashsticks has got around this by providing videos of a native speaker saying each word. I found this really helpful as you can see how the words are formed, rather than just listening to a recording and hoping for the best. Another huge advantage is the ability to scan an item and have your phone tell you what it is in different languages. I have no idea how this works but it does. If I were to scan a rose, say, it would tell me the translation for 'red rose flower' and then I can simplify it to something more specific like 'red flower' or 'rose'. The only downside with this is that it automatically defaults to French so I have to switch it to German all the time but it was so handy when I was in Austria. My favourite thing about Flashsticks, however, is the games. Oh man, they are so addictive! You have a time limit to solve as many puzzles as possible and beat your high score. I'm one of those people who is super competitive and always wants to beat their own record so I can get a little carried away at times! The only downside I've experienced is that there is no assessment at the beginning to gauge my current level. Since I studied German at school and had been learning for a few months before installing Flashsticks, I had a fairly good working knowledge of the language but I've had to start with learning the words for mother and bread. There's nothing to stop me skipping ahead and starting with the more advanced lessons but I'm a completist and then I wouldn't be able to complete 100% of the course. I'd also miss out on the occasional word in the early lessons that I haven't come across before. If you're looking to learn a new language, Flashsticks is a great place to start. By the end of the course, I should have learned 1850 German words which isn't too shabby! I loved Flashsticks! I have the post-it notes dotted all round my room for quick reminders haha. I think there's a few different levels that you can get for each language so that might be worth looking at! I would love to learn another language and German was the one I picked at school yet I can hardly remember anything now! I'd love to try out an app like this to learn maybe French, German or spainish. Italian has always been one I've been intrigued by too!